Price Range £127 - £128Price RangeSimply drag the slider bar to set your price range. 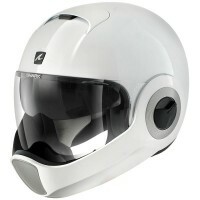 The Shark Vantime helmet is Shark's first full face urban helmet for riders seeking protection and urban styling. Sporting an extended, anti-scratch outer visor with air inlet diffusers for greater surface demisting, along with a integrated UV anti-scratch drop down sun visor. Other features on the Vantime include; removable and washable natural bamboo fibre interiors, quick release micro lock buckle system, optimal comfort for persons wearing glasse,s and a Planned location for Shark's Sharktooth Bluetooth system.